For even sensitive skin. Removes make-up + cleanses + soothes. No rinsing. Face, eyes, lips - no perfume. Dermatologically and ophthalmologically tested. 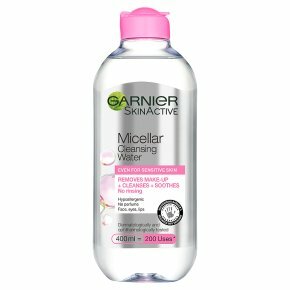 Is Garnier Micellar Cleansing Water Right for Me? Yes, if you are looking for an efficient and easy to use product that cleanses and remove make-up gently in 1 step. Why Is It Different? Micellar Cleansing Water is an easy way to remove make-up, soothe and hydrate the face, eye area, and lips, in 1 step without rinsing. How Does It Work? For the 1st time, Garnier introduces the Micellar technology in an all-in-one cleanser. Like a magnet, the cleansing agents capture and lift away dirt from the skin. No need to rub to remove impurities and make-up. The Result: Perfectly cleansed and refreshed skin without rubbing or rinsing. Micellar Cleansing Water has a soothing and fragrance free formula that suits all skin types, even sensitive. Micellar Cleansing Water comes in a generous 400ml format for up to 200 uses*. *Based on 2ml per cotton pad. How to use: Apply the product to a cotton pad and wipe the face, eyes and lips. No rinsing required.